Combining a cohesive visual identity with ease of use to create a space that consumers respond to. 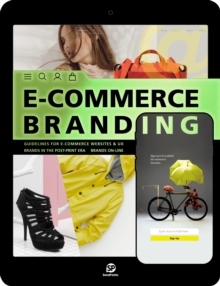 E-Commerce Branding provides an essential guideline from webpage design to brand image in both digital and print media. With page-by-page examples of wireframing for both classic and innovative layouts, theme discussions with international design studios and numerous case studies where both traditional elements such as logos, product photography and packaging, and special effects such as 3D, stop motion, video and audio have effectively been employed to augment user experience.